Handling your auto body work here in NYC since 1959. 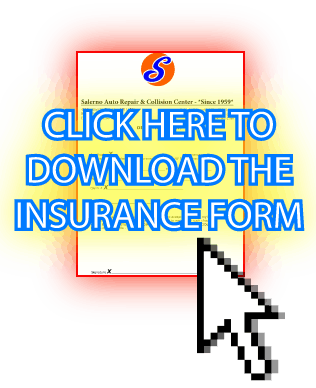 You can view and download our Insurance Form by clicking on the picture with the big arrow here. Just print that out, fill in the fields and you’re ready to go! All major insurance plans accepted and we would be happy to arrange a tow for you. Call or text our recommended towing company at (718) 388-2219, anytime day or night. Had an auto collision in the middle of the night? Not sure who you can call in New York, Brooklyn or Queens that will take a towed vehicle, expertly handle the repairs AND work with your insurance to handle the costs? We’re Salerno Service Station and we’ve been sorting-out late-night auto problems since way back in 1959. A 3rd generation, family-owned, full-service auto shop in Williamsburg, our Auto Repair and Bodywork are unparalleled in quality, value and longevity. We’re open 24 hours a day, 365 days a year. 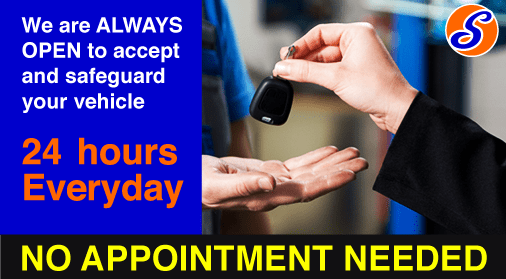 So, we’re always ready to have your car towed-in for one of our attendants to accept and safeguard until morning. Our team of mechanics will expertly evaluate the damage and give you a full report the next day. We pride ourselves on superior bodywork and precision repairs, and accept all major insurance carriers. Salerno Service Station, keeping NYC rolling strong for over half a century. When your arrive with your vehicle, just leave your keys and information with one of our attendants. We will expertly diagnose the problem first thing in the morning and call you right away with a free estimate. Click this link and have a look at our Yelp reviews. See for yourself why our customers keep coming back, year after year.